This super cute paper flower tea party was hosted by Crystal of Legacy Wood Designs. Crystal won a contest I hosted a little while back and won some super cute stemmed paper flowers. And I absolutely love the way she used them! SHE THREW A TEA PARTY! Crystal makes beautiful wood signs that make perfect home decor, or are perfect for cute events like this! And she makes wedding signs too! Take a look at the photos below! And if you can’t tell, her photography skills are pretty on point too. To inquire about paper flower orders contact me at FloralbyEmilyJane@gmail.com. A little while back I had the opportunity to team up with some great vendors to put together this beautiful Valentine’s Day themed styled shoot. It was nothing short of a dream, and building relationships with amazing local wedding vendors is one of my favorite things to do! For this backdrop I decided to do something different. I attached the flowers to posted boards and then hung the boards over the backdrop stand. This way was so much easier, compared to attaching the flowers individually on location. I also love the look of this style much better. Doing it this way allows me to take my time to place the flowers exactly where I want them, and set up takes way less time. So it’s a win win! If you’re local to Chicago and are interested in renting this beautiful backdrop, please reach out to me at FloralbyEmilyJane@gmail.com. And, if you’re looking for any other great wedding vendors, take a peek below! Wow I am so excited! I just planned my first ever paper flower workshop and you’re invited! I have learned so much during this hobby turned business and I want to share the best tips and tricks with you! I wish when I started doing this last year that I was able to find something like this local to me. That’s why I’m extending this amazing opportunity to 13 people! I found this amazingly gorgeous venue in Lisle that the workshop will take place and there’s going to be snacks and refreshments! Plus, guests will have the opportunity to win raffle prizes, flower templates, and will go home with a large paper flower! So join me on May 27th from 1-3 pm in Lisle. I can’t wait to host this event for you! I’ll also be planning more, so stay tuned! Purchase your tickets here. And, to receive updates and teasers, make sure you follow me on Facebook! 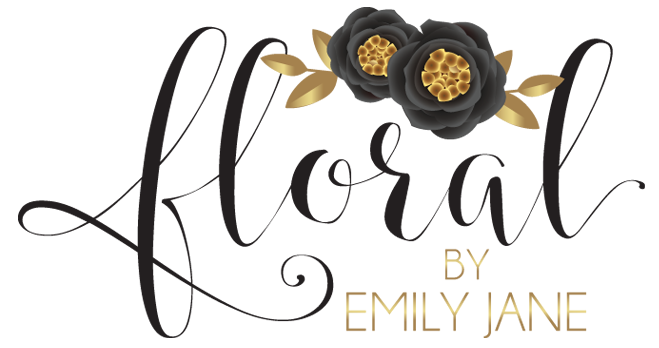 Floral by Emily Jane absolutely loves working with Hu’s Assisting. This Tiffany’s inspired sweet 16 birthday party is so jaw-dropping. I mean who doesn’t love everything Tiffany’s?! With only two paper flowers on the photo backdrop, it still pulls the theme together. These flowers were made using my large, 20″ Ashton paper flower template. I spray painted the edges in a metallic silver to match the Tiffany’s theme, as well as a foam ball cut in half for the centers. This just proves that you don’t need a ton of paper flowers to pull the entire event together! I teamed up with Erin from EK Photography to get some beautiful photos of this set of 5 paper flowers. She sent me a few inspiration photos of the comforter that purchased and the wall art so I could match the colors. The wooden signs are from Rustic Pine Home Design. Check out their Etsy shop. The wooden A can be purchased from Hobby Lobby. They are originally $12, make sure you use a coupon! Spray paint to customize! To purchase your custom set of paper flowers visit my Etsy Shop or send me and email at FloralbyEmilyJane@gmail.com.